First, I have to admit that I’m pretty sure I stole the title above from an article by Warren Mackenzie, the consummate American potter, which I read 15 or 20 years ago (I cannot find it to cite it). When I read that article, I hoped it would be an easy answer to what has been a life-long search for the right green glaze. It wasn't (but I enjoyed the article nonetheless). Since then, I've fired countless test-tiles of experimental glazes and flirted with a handful of potential contenders, but have always lost interest or lost patience with all of the green glazes I've used over the years. 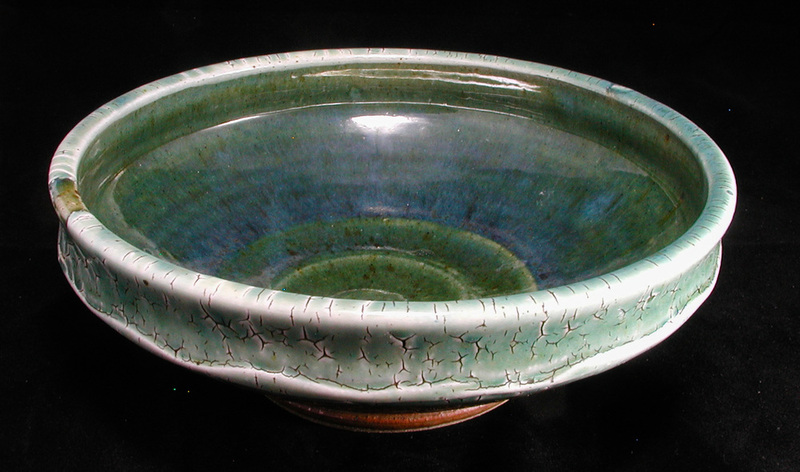 -The glaze is influenced greatly by the clay body and slips over which it is applied. Over porcelain and various kaolin slips, it varies from a "fat," semi-mat, deep green or turquoise with the ability to develop occasional patches of pinks and reds, to a nearly transparent glossy hint of green-almost a very faint celadon. The fired colors and textures are very receptive to variations in kiln atmosphere, application thickness, temperature, location in the kiln and cooling rates. In other words, it will take some serious time, perhaps more than a lifetime, to learn how to get the results desired for any given piece and ultimately, I suspect there will always be some surprises with this glaze. -Over iron-rich stoneware clay bodies, the glaze varies even more dramatically; from an iron-spotted, gray, nearly opaque surface to a shiny and very runny mottled bottle-green. It also sometimes produces an (as yet) unexplained blue halo on the insides of bowls and other closed forms. The same variables mentioned above which can make it so striking on porcelain seem to have varying and often opposite results on stoneware, which further fuels my interest. 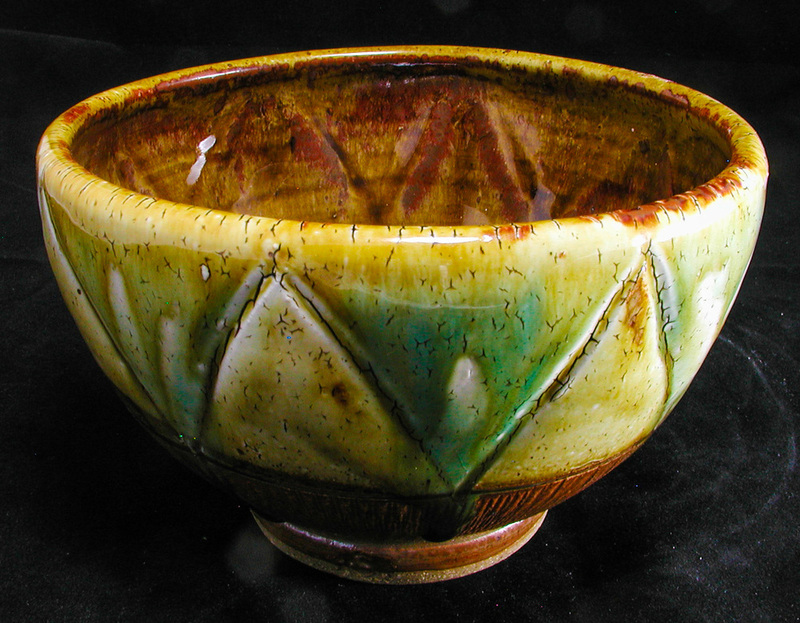 Stoneware bowl with crackle slip, ash glazes. -Finally, this glaze, like most of the other ash glazes I have developed, is quite conducive to the growth of orange to black crystals in the glaze matrix during the cooling phase of firings. The coverage and size of the crystals is influenced by the rate of cooling during the initial 200-300F drop at the conclusion of the firing and by the atmosphere in the kiln during this phase. There is enough here to keep me interested for a long time. It could be conjectured that the bullet points listed above do not qualify this glaze as a "keeper," but rather would make such a glaze unreliable and perhaps even a fool's path to follow in pursuit of professional and financial success. It could indeed, and I am ecstatic anyway because I have found a green! It makes the prospect of making a living as a potter look a little less anachronistic in comparison. I look forward to introducing some pots with this new glaze to public scrutiny at my Summer 2014 Kiln Opening. The exact dates have not been finalized, but I'm looking at the 3rd and 4th weekends of June. Will you be in town? Let me know, if you like and watch here for an announcement early next week. I hope to see you there! Sincere "Thanks!" to those of you who have provided early feedback on this glaze and beta-tested new pots in your homes! Porcelain bowl, slip decoration and caved rim. Ash glazes.